Identifying the hazards in the home is the first line of defense. Most floors, in the bathroom, are hard and slick. Using grab bars, in the shower, or next to the toilet and shower mats in the tub are simple and inexpensive solutions. Grab bars next to the toilet can help prevent falling and also aid in standing up. Alex’s full line of bathroom safety products, are affordable solutions that provide assurance, confidence, and aide in the prevention of injuries. Often the senior’s may live with their children as caretakers . The newer homes might have wood or tile floors through out. These surfaces are slick increasing the chance of falling, as opposed to a traditional carpeted floor. These types of floors often become very cold during the cooler months of the year. Wearing traditional socks may keep your feet warm but they make an already slick surface even more slick. Getting a few pairs of Alex’s Slip resistant booties or socks , is a great way to reduce your risk of falling. These socks come in a variety of sizes to accommodate any shoe size. Not only will these socks keep your feet warm but the non-slip pads on the underside work to help in the prevention of falling. Other ways to prempt a fall, is to remove rugs that might catch a foot, increase lighting in hallways, and areas that tend to be dark, make sure the rails on stairways are secure and well lit. Installing grab bars in areas where seniors tend to migrate, living areas , tv room and kitchens gives the seniors a sense of security as they move independendly around the house. 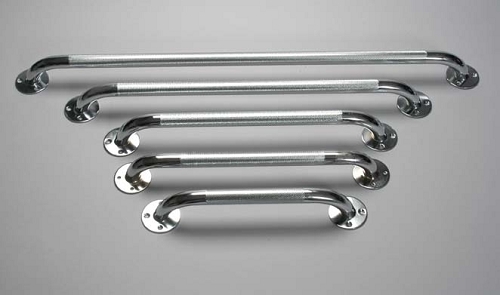 Alex orthopedic offers grab bars in 12”,16”,18”,24” and 32”, that will fit any area where a helping hand is needed. They are rust resistant, in chrome or white, offering a textured surface to help provide grip, even while wet. There are many places that you can fall in your home, but one place that is often overlooked is your own bed. There are multiple ways to prevent yourself from falling out of a bed. The quickest solution would be to look into getting a home bed rail. These rails slide effortlessly between your mattress and box spring and serve as a barrier to help keep you contained on your bed at night. Many people prefer a standing bed rail which in addition to sliding between the mattress and box spring also has a pair of legs which extend to the floor. This type of bed rail is excellent for getting into and out of the bed. 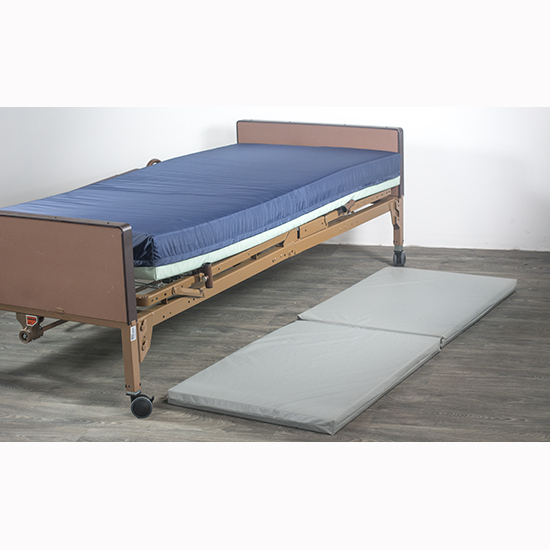 The added support makes it sturdier when gripping and putting your full body weight on it to get into or out of the bed. In some cases these bed rails just aren’t practical or no matter what you try if there is a high likelihood you or someone you know will fall out of their bed during the night. If falling cannot be prevented by another means having a fall mat can prevent serious injury from occurring. These are especially convienent, if the senior is visiting and only staying for a short visit. The Alex fall matt doesn’t require any difficult, or special preparation of the room. These mats fold for easy storage when not in use. When laid flat they cover the length of the bed and are 24’’ wide , 68” long with a 2” thick padded foam. While every effort should be taken to prevent falling from the bed if it cannot be avoided the fall mat by Alex is your best option. The NCOA recommends several steps to preventing a fall. Always check with health providers and share any history of falls. Getting eyes and hearing checked regularly , checking with the pharmacist to make sure the drugs are not increasing the risk, and discuss any concerns with family and caretakers . Awareness is the key. Take the Silver Sneakers 30 sec sit to stand challenge . If 10-19 reps can be achieved, while rising from a chair in 30 secs ,the risk of stopping a fall is good. If that number can’t be done, the risk to take a fall increases. As we age, our lower -body strength and endurance weakens. Getting into a regular program to build balance, strength and flexibility can help lessen the risk of a fall, resulting in an injury. The local YMCA , fitness clubs, and rec centers are good resources for classes and assistance. There are many products to help seniors live safely, joyfully and independently at home. Check out Alex Orthopedic’s many solutions to making home life safe, accessible and most important enjoyable.